Full service medical supply store in Honolulu, HI stocked with lots of products in their showroom to view and try. Centrally located in town with parking and ADA accessible entrances. Select from a wide range of products, including mobility scooters, power wheelchairs, and power lift chair recliners. When health problems affect your mobility, power scooters can provide a safe and comfortable way to get around. However, with many products available on the market today, it can be tough to know which product is right for your needs. To make the selection process easier, here are a few factors to consider when choosing the best mobility scooter for you. 1. How Easy Is It to Maneuver? As you test out different scooters, pay attention to how easy it is to operate the controls. Most models, for example, feature an easy-to-use handle to steer the device. If you have arthritis, make sure you can grip these controls easily. 2. Is It the Right Size for me? Power mobility scooters come in a variety of shapes and sizes, so check that the equipment will fit in your regular environments as well as accommodate your body size. If you are planning on using your scooter in your home choose a scooter that can travel through all the doors in your home as well as any ramps you plan on using. 3. Where will I be using it? The configuration, size and type of a scooter can affect how well it travels in specific environments. For example, a small three-wheeled scooter works best indoors since it can turn in tight spaces, whereas a large four-wheeled model provides long range and stability for outdoors. 4. How Much Weight Does It Support? When a scooter’s weight capacity is exceeded, it may travel slowly or be difficult to control as well as damage the scooter itself. Choose a model that can support your weight plus any other items you regularly bring along. 5. How Will I Transport It? 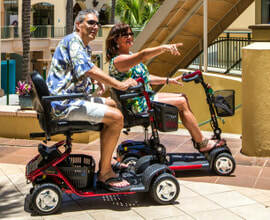 When you’re ready to upgrade the way you get around, turn to Dauterman Healthcare & Mobility in Honolulu, HI. Providing affordable and reliable medical supplies to customers for over 40 years, we can introduce you to a variety of top-notch mobility scooters. We will help you explore the pros and cons of different models to find a comfortable mobility aid that fits your transportation and budget preferences. To learn more about our expansive product selection and financing opportunities, visit our website or call a friendly store associate at (808) 591-8860.